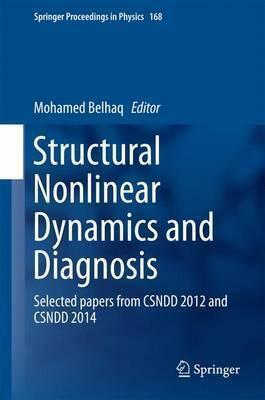 This book, which presents the peer-reviewed post-proceedings of CSNDD 2012 and CSNDD 2014, addresses the important role that relevant concepts and tools from nonlinear and complex dynamics could play in present and future engineering applications. It includes 22 chapters contributed by outstanding researchers and covering various aspects of applications, including: structural health monitoring, diagnosis and damage detection, experimental methodologies, active vibration control and smart structures, passive control of structures using nonlinear energy sinks, vibro-impact dynamic MEMS/NEMS/AFM, energy-harvesting materials and structures, and time-delayed feedback control, as well as aspects of deterministic versus stochastic dynamics and control of nonlinear phenomena in physics. Researchers and engineers interested in the challenges posed and opportunities offered by nonlinearities in the development of passive and active control strategies, energy harvesting, novel design criteria, modeling and characterization will find the book to be an outstanding introduction. Illustrations note 13 Illustrations, color; 252 Illustrations, black and white; XIV, 509 p. 265 illus., 13 illus. in color. Recent Advances of Structural Life Assessment and Related Problems.- Electromagnetic Impact Vibration Energy Harvesters.- Numerical and Experimental Assessment of the Modal Curvature Method for Damage Detection in Plate Structures.- Proposal of a Nonlinear Piezoelectric Coupling Term to Energy Harvesting Interactions.- Effect of Reinforced Concrete Deterioration and Damage on the Seismic Performance of Structures.- Recurrence and Joint Recurrence Analysis of Multiple Attractors Energy Harvesting System.- Quasiperiodic Galloping of a Wind-Excited Tower under External Forcing and Parametric Damping.- On Optimal Control of a Nonlinear Robotic Mechanism Using the Saturation Phenomenon.- Quasi-Coordinates Based Dynamics Control Design for Constrained Systems.- Quasi-Periodically Actuated Capacitive Micro electromechanical systems.